Every fall I see these amazing stuffed squash recipes all over the internet and always imagine I will make one someday. 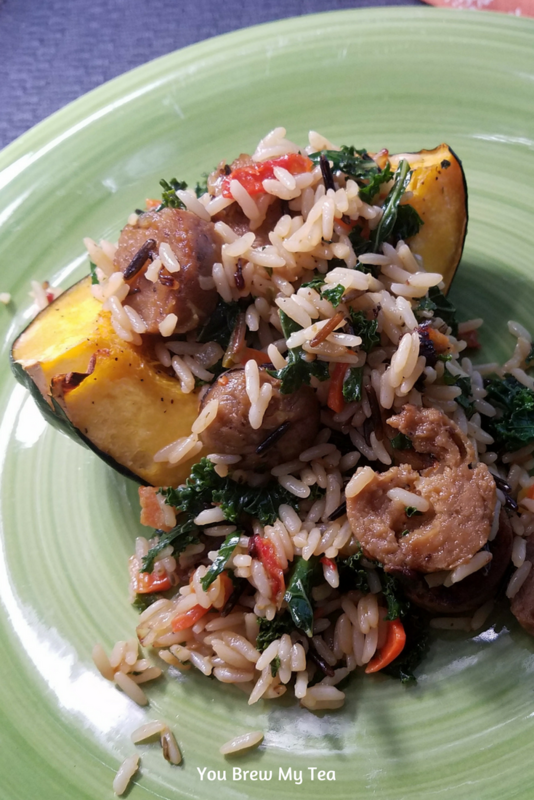 That someday was this week, and the result was this delicious Vegan Stuffed Squash with Wild Rice and Sausage. Yes, this is totally vegan and absolutely delicious! Even the meat eaters in our house loved it. With only 8 SmartPoints per serving, it’s also a great Weight Watchers recipe! This post contains affiliate links for Amazon. I earn a small commission on purchases made via these links. Let me start by talking about how stuffed squash is one of the easiest recipes to make of all time. Just a few minutes of preparation and I had this in the oven. 25 minutes later, I had a meal that was easy to scoop out onto a plate and enjoy. As a plant-based Weight Watchers dieter, I am always looking for flavorful meals, and this definitely hit the spot. If you aren’t a vegan or prefer to eat meat, you can easily substitute my chosen sausage below for any chicken or turkey sausage that is lower in points. In fact, it may be more point friendly for Weight Watchers followers to use a meat sausage if they are meat eaters. I prefer my vegan Field Roast brand sausage, but you can adapt as needed. Field Roast can usually be found near the tofu or other vegan “meats” in your local grocery store. Preheat oven to 375 degrees. Line baking sheet with a silicone baking mat, or parchment paper. In a small saucepan, heat vegetable stock, 1 teaspoon olive oil, wild rice, diced carrots, diced onion, and seasonings. Bring to a boil, reduce heat, then cover for 15 minutes. Cut acorn squash in half, and scoop out seeds. Quarter the acorn squash, and lightly brush or drizzle with remaining 1 teaspoon olive oil. Once the rice has cooked for 15 minutes, remove the cover, fluff with a fork, and add in chopped kale and diced sausage. Mix well until combined. Scoop 1/4 rice mixture onto top of each 1/4 of acorn squash. Place in oven and roast for 20-25 minutes or until heated through and squash is tender. The filling may fall out a bit depending on how deep the squash is, but can easily be scooped back inside. Scoop ¼ rice mixture onto top of each ¼ of acorn squash. Place in oven and roast for 20-25 minutes or until heated through and squash is tender. The filling may fall out a bit depending on how deep the squash is, but can easily be scooped back inside. This recipe for vegan stuffed squash is a delicious fall meal. In fact, it is so good, we have decided this can easily be our Thanksgiving meal with a few extra sides of vegetables. 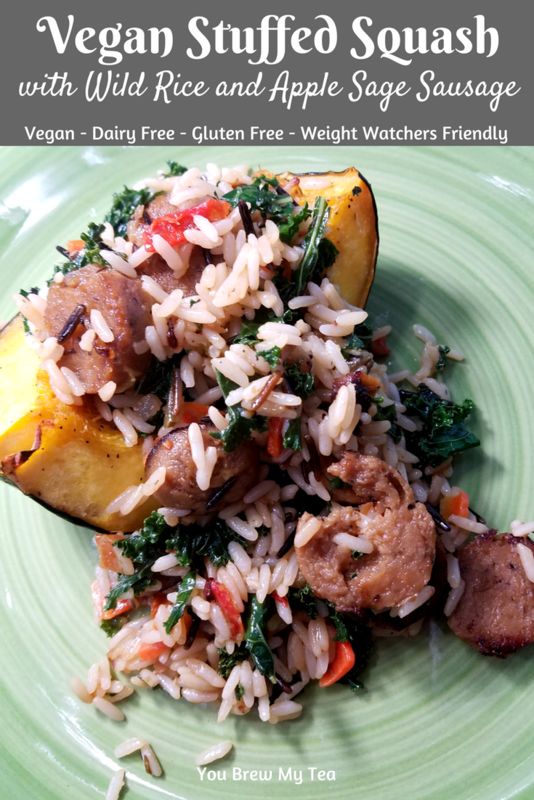 The flavor of the sausage and rice compliment the squash beautifully, and we love how it is full of fiber and healthier. 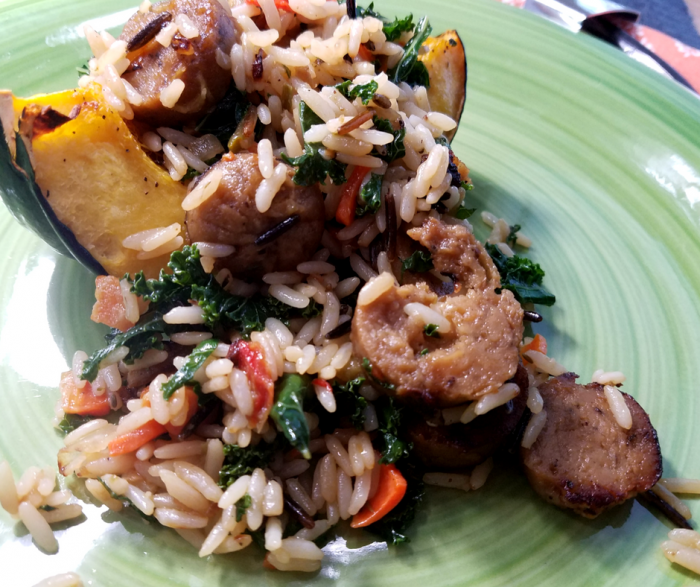 Make this delicious vegan-friendly entree with our preferred Field Roast Apple & Sage Sausage or your own preferred vegan protein for a meal that the whole family will approve of at the dinner table. This recipe looks wonderful. I have recently started to take a second look at acorn squash. I always preferred butternut but acorn is proving to be sweet and tasty as well. Oh my, this looks so delicious!! Thanks for sharing on More the Merrier Monday link party!! We love stuffed squash and this looks delicious! Thanks so much for sharing your post with us at Full Plate Thursday! Have a great week and come back to see us real soon!